The model 438-1B de-reeling and tension stand is an air actuated caliper brake exclusively designed to provide remote tension control, supporting coil winding processes substantially. 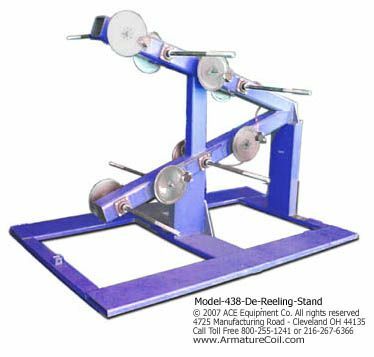 The model 438-1B de-reeling and tension stand is designed with 8 de-reeling units attached onto a tension stand. Model 438-1B is available in the below mentioned specifications. Net Weight – 500 Lbs. Gross Weight – 600 Lbs. It is brilliantly designed to eliminate spool roll-in when de-reeling has stopped. It is easy and convenient to adjust the machine’s tension. An operator can perform this action himself, while operating the machine. An adjustable air pressure regulator is provided for this purpose. It is easy to release all the tension on the spool by means of a manual air cutoff switch. The spools return to the pre-set tension with a press on the switch. It is easy to control the tension of each de-reeling unit independently. An adjustable air pressure regulator is supplied for this purpose. ACE has designed this innovative de-reeling tension stand to handle spools of round, square, rectangular or flat wire. Spool capacity ranging 24" diameter x 7" to 12" width. Spool hole size ranging 1-1/4" to 2-1/2" diameter. Spool support shaft ranging 15" from the floor, 1 1/4” diameter. Spool weight capacity 500 Lbs. It is engineered with cold formed steel sheets. This rugged construction helps it withstand stress and impact. Years of uninterrupted service are guaranteed due to its smart design and brilliant engineering. BRAKE AIR PRESSURE P.S.I. 12" DIA. DISK 1 BRAKE - 1B FT. LB. 12" DIA. DISK 2 BRAKES - 2B FT. LB. 18" DIA. DISK 1 BRAKE - 1B FT. LB 18" DIA. DISK 2 BRAKES - 2B FT. LB. 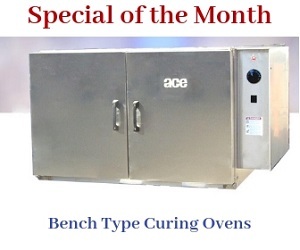 To support the device’s functioning and augment its efficacy, ACE offers a dual pressure control valve as an accessory. This two position manual valve is designed to apply tension and drag pressure. The operation of this stand-alone unit is simple - when one position applies tension, the other applies drag pressure. Also, the operator can easily control the tension and drag pressure during its operation. The unit is provided with two regulators, one for adjusting tension, and the other for controlling the drag pressure.